We are delighted you have found your way to us. We gladly invite you further into learning with and about the Oak Grove congregation. In the Search box, type “Oak Grove Presbyterian Church.” You’ll see a picture of our church. Click on the service you would like to watch, and enjoy! Welcome to Oak Grove! We extend a special welcome to those who are single, married, divorced, LGBTQ, straight, filthy rich, dirt poor, or don’t speak “Minnesotan.” We extend a special welcome to those who are crying newborns, broken-hearted, or in need of a safe place. We don’t care if you are more Presbyterian than John Calvin or haven’t been to church since little Jimmy got baptized. We welcome you if you can sing like Christina Aguilera or Justin Timberlake, or if you are like many of us who can’t carry a note in a bucket. You’re welcome here if you’re just browsing, just woke up or just got out of jail. We don’t care if you believe in God or if you’ve never been to church. We extend a special welcome to those who are over 60, but not grown up yet, and to teenagers who are growing up too fast. We welcome fourth-graders and 90-somethings. We welcome those who are liberated by wheelchairs or walkers. We welcome soccer moms, NASCAR dads, starving artists, tree-huggers, latte-sippers and Mountain Dew drinkers, vegetarians, carnivores, junk-food eaters and even Packers fans. We welcome you if you have some memory challenges. We welcome those who are in recovery or still addicted. We welcome you if you’re having problems (who isn’t?) or you’re down in the dumps or if you don’t like organized religion. We’ve been there, too. If you blew all your offering money partying, you’re welcome here. We offer a special welcome to those who work too hard, don’t work, can’t spell, or are here because grandma is in town and wanted to go to church. We welcome those who are inked, pierced or both. And we welcome those who could not imagine being inked or pierced. We offer a special welcome to those who could use a prayer right now, had religion shoved down their throat as a kid or got lost in traffic and wound up here by mistake…We are glad YOU are here! We seek to follow Jesus, wherever the Spirit leads. We are a safe place. We are all about grace, not guilt. Oak Grove is a progressive congregation, proud of its long history in the community, but looking forward not backward. Oak Grove is unusually open to new ideas and new ways of doing things. Our heart is mission. We are vitally involved in numerous mission ventures, locally and around the world. We are excited that the last seven years we have raised our mission budget by 10% each year and we hope to do it forever. We are intentional about being multicultural. A recent new member class had 21 people from five different countries! Altogether our members come from 12 different birth nations. We are glad to be a part of the Presbyterian family, but our allegiance is to Jesus, not to any denomination. Many of our members have come from other denominations or from no church background at all. We are fully welcoming of LGBTQ+ folks and have an active Rainbow Fellowship. Our restrooms are fully accessible for all genders. Jesus welcomed the little children. So do we! We invest a significant amount of our resources in children and youth programming. Our music program is renowned both for its quality and for how much fun the participants have! Finally, let me say that we know we don’t have all the answers, but we do wrestle with the questions. We aren’t about dogma. We try to follow Jesus. We attempt to craft worship services with integrity and vitality, in which all ages are welcome. Congregational and choral singing is accompanied by a variety of instruments and includes both traditional and contemporary hymns. Sunday Worship times are 8:15 & 10:45 a.m. with Faith Formation for adults and children at 9:15 am during the School Year. Our Summer Worship schedule begins Memorial Day weekend with one service at 9:30 a.m. It doesn’t matter what you wear. Some people wear suits or dresses; others come in casual slacks, jeans or shorts. You are welcome regardless of what you decide to wear. What Do You Do in Worship? We will not ask you to stand up and introduce yourselves. Our services are informal, fairly traditional, but with a variety of music. Our chancel choir normally sings at the 10:45 service and at both services on the first Sunday of the month. Our folk group, Wellspring, sings at both services once per month. There is a “children’s time” and our pastor often uses his ventriloquist puppet, “Gramps,” for this. The 8:15 worship service usually lasts 45-55 minutes. The 10:45 service usually lasts 55-65 minutes. Generally we rise for prayers and songs. There is no kneeling. Yes. To encourage the presence and participation of children, we make available “worship bags” filled with learning activities for our youngest worshipers and also set aside a special time in the service for a story or conversation specifically with them. Professional child care is available during every worship service in our well-equipped nursery for infants or toddlers, but parents are welcome to keep their children with them throughout the service if they wish. We have a high tolerance for the joyful noises of little ones. We have an area in the front of the sanctuary on the right (as you look toward the front) with plush toys and quiet activities. A number of our young families choose to sit in that area. Do I Need to Make a Financial Gift? No. The offering part of the service is our way of giving back to God for the many blessings we have received, but there is no obligation to make a contribution. If there is Communion, Should I Participate? The sacrament of communion is celebrated on the first Sunday of each month. 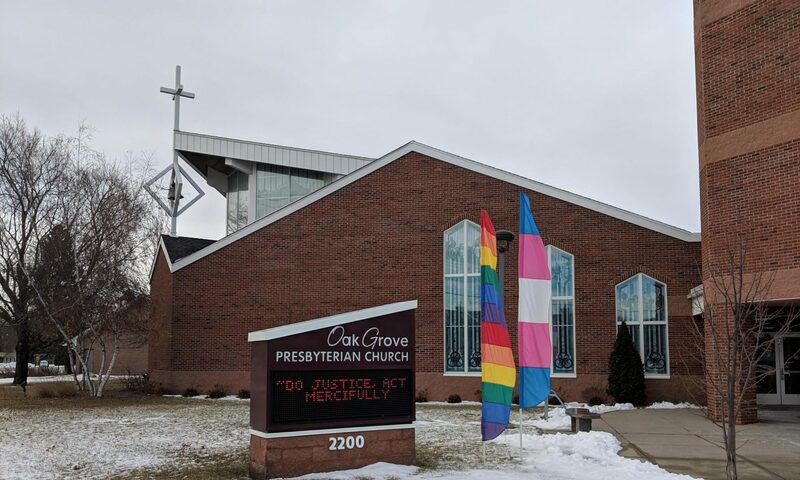 Oak Grove Presbyterian is an inclusive church and all are welcome to participate. Gluten-free bread is provided for those who are gluten intolerant. Children are welcome to participate as well, if parents allow. Yes. There are many handicapped parking spaces available outside the main doors. Should you park in the lower-level parking lot, you may access the elevator to the second floor through the doors on the east side of the building. We have members who use wheelchairs, walkers, oxygen, and canes and access to the church is not a problem.